ahhhh. The sequel to the blockbuster comedy. Good idea or not? Especially when it's a funny, slapstick comedy that had you laughing so hard you nearly spit out your coke and choked on your popcorn. Those movies often pop out a sequel. Mainly because they made so much fricken money the first time around. Of course they will tell you it was because they had such an amazing time making it they want to get together again. Uh, yeah. We're not stupid ya' know. We know you made a slapstick comedy, it was a way bigger hit than you expected, and you can now shop at Whole Foods without looking at the prices. And you're kind of digging that. 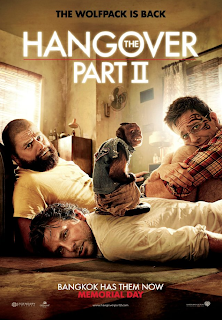 So here we are with The Hangover Part II out this weekend. Don and I loved the first one. It was one of those movies where we kept recalling scenes and laughing all over again - the tooth scene, the tiger in the bathroom, Heather Graham, that crazy guy in the trunk, and Mike Tyson. Do you think that was really his house? So when we saw the preview for the sequel we knew we had to see it. We had to see what the new adventure would be. And guess what? wah wahhhhhh. It's the same thing all over again!!!! They tried to recreate the exact same plot. Why would they do this? We already know this plot. It felt really contrived, like they got to a point in the script and said "Ok, that's funny now let's have them do this, and then this, and then this." It just jumps around from here to there and back again. 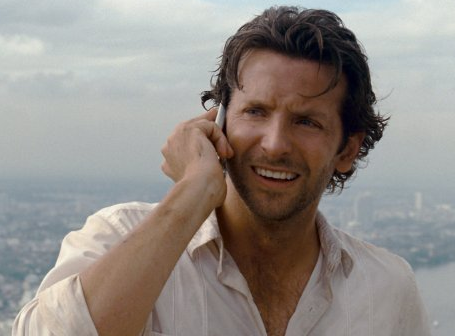 The acting isn't good, especially Bradley Cooper. There is one scene where they have a long closeup of him trying to think of what the guys should do and I swear it feels like he's making it up as they're filming. Bradley Cooper. This dude is hot, even when he's all sweaty. Zack G. is funny and odd like in the first movie. He plays this part well. But again, it's just the same thing all over again. It would have been better if they had the guys get together for something other than a bachelor party. There are some laughs. But, it's nothing like the first one. I think this is a watch it on Netflicks sequel. Sorry fellas.